Watermelon cocktail with a shot of bourbon and exciting Kolsch style beer action. Perfectly refreshing on a hot summer day. So much so that you might feel an irresistible urge to permanently trade up tired, overly sweet daiquiris. Considering the popularity and inexplicable appeal of vodka infused whole watermelons it stands to reason that watermelon cocktails with vodka should be very popular. They are. Because it tastes good and makes this watermelon drink taste better in addition to lending it alcohol potency. Vodka adds no flavor to the juice, it is virtually undetectable, while bourbon brings sweetness and infuses with mellow hints of vanilla, spice and toasted nuts. And there is simply something magical about the flavor alliance watermelon forms with bourbon. The typical fruity and sweet biscuity flavors of Kolsch style beer add on to the harmonious combination. We are almost ready to publish a really cool beer tasting article all about Kolsch and Kolsch style beer, its origins and history and its current state of affairs. It is coming up really soon here on the blog and we will link to it. For now let me just say that Chris and I agree that Kolsch is absolutely the perfect style to add as ingredient to this beer cocktail and it considerably enhances its merits. We went with an extremely well crafted representative of the style, Fate Brewing Laimas Kolsch Style beer. Since this drink is centered around watermelon your first order of business is to secure watermelon juice. We strongly recommend that you make juice from fresh fruit, nothing you can buy bottled will ever come close. To make the fresh juice all you have to do is process watermelon pieces in a blender. Choose a seedless variety and be careful to remove any seeds that may have actually developed. Remember – the pollinators such as bees are the boss when it comes to having or not having seeds in a fruit. They can easily pollinate a batch of blossoms of seedless variety fruit (applies to any kind) with a regular full seed one. Therefore some seeds could actually be found in a seedless fruit. Here are suggestions on how to pick watermelon and how to properly cut it. Once you have your blended watermelon juice you can either use it straight away or strain it to separate it from all the fiber. It is up to you. I personally love the consistency of the blended fruit, the thicker mouthfeel is desirable to me. 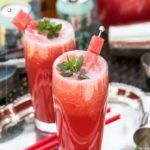 You can also make a watermelon slushie and use it as the base of this cocktail or just have your kids enjoy it while you are having the real deal drink. You have two options to do so. Once you have your fresh watermelon juice (or slush) you are ready to mix. Start by pouring the cold Kolsch style beer first. You can comfortably split a regular sized 12 ounce can or bottle three ways. Wait for the foam to dissipate. Slowly add the watermelon juice or slush. Upon contact with the beer the watermelon slush or not strained juice will produce a bit of extra foam. Measure out the bourbon (if you like more, add more than what our recipe calls for) and chill it in a cocktail shaker over ice, then add it to your watermelon drinks. Give the mixture in each glass a stir with a cocktail stirrer. Garnish with a piece of watermelon and a sprig of mint. You can cut thin small wedges of melon and slit them to mount onto the rim of each glass or make mini watermelon skewers. Stick a straw in each glass and serve. 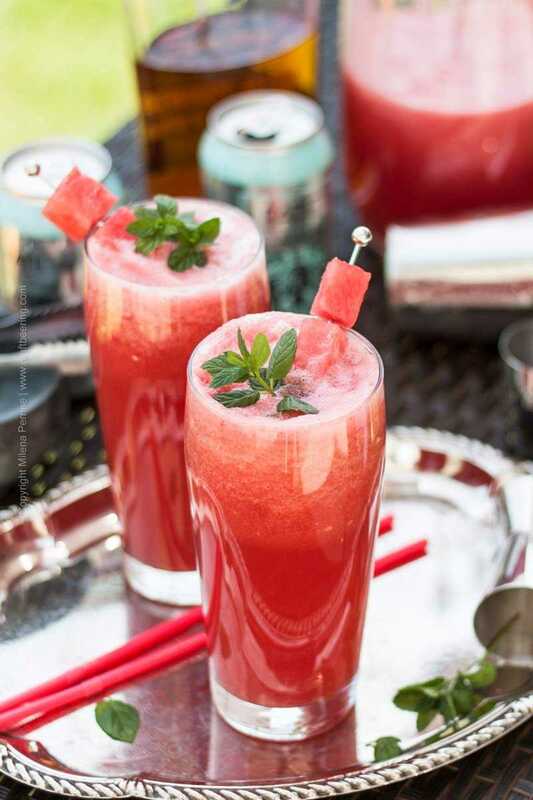 I will leave you with a few more ideas on creating watermelon cocktails. make the juice or slush as described above and use gin and tonic to create a watermelon gin and tonic cocktail. Or if you can get your hands on the Anderson Valley G&T Gose beer (or another beer brewed in the spirit of gin and tonic) use it for really fun results. if you do not want to taste any liquor flavor but desire it’s supportive alcohol boost in your cocktail, use vodka and keep the Kolsch. 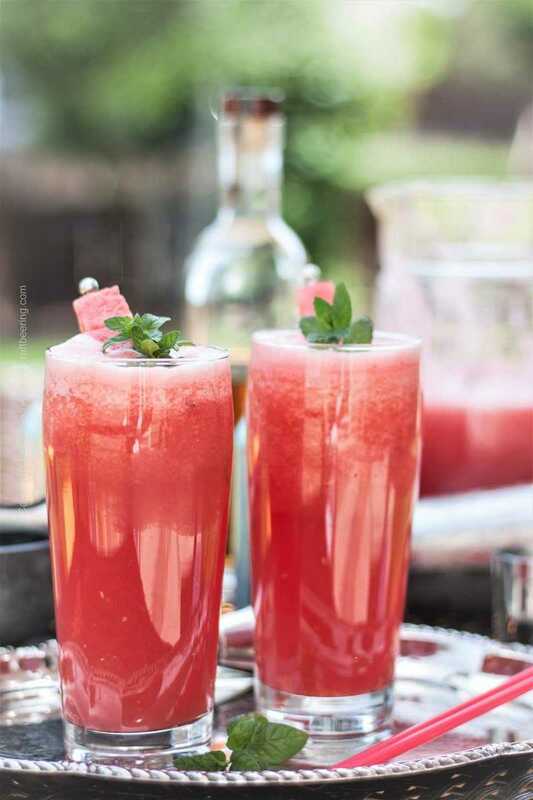 make a watermelon rum punch by simply spiking the watermelon juice or slush with white rum and adding a splash of gose or limeade. Watermelon cocktail with bourbon and fizzy Kolsch. 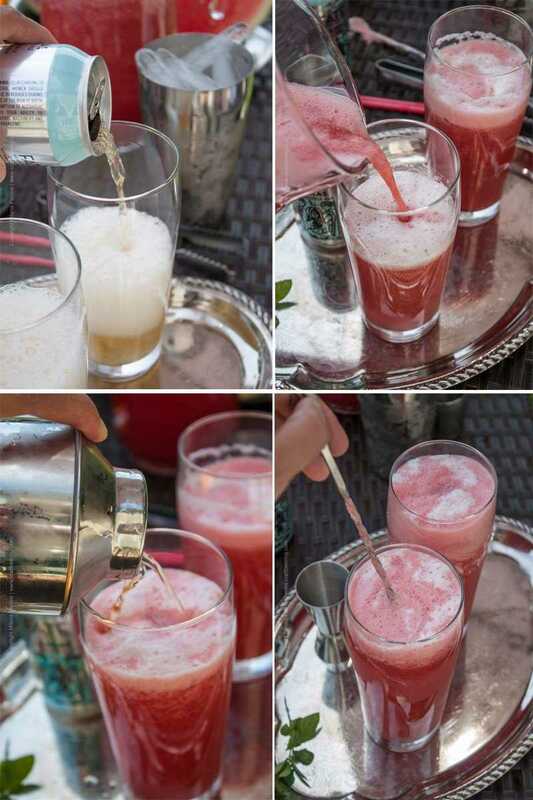 Refreshing watermelon juice (or slush) is spiked with flavorful bourbon and infused with fruity Kolsch style beer. Cut the watermelon in pieces. Remove any seeds that could still be found in seedless varieties. (If you prefer a slushie version of the cocktail, freeze the pieces first). Blend the watermelon in a blender or a pitcher using a handheld immersion blender. (If using frozen pieces add a splash of water to facilitate the blending process). Optional: strain the watermelon juice. Divide the chilled Kolsch style beer equally between three glasses. Wait for the foam to dissipate. 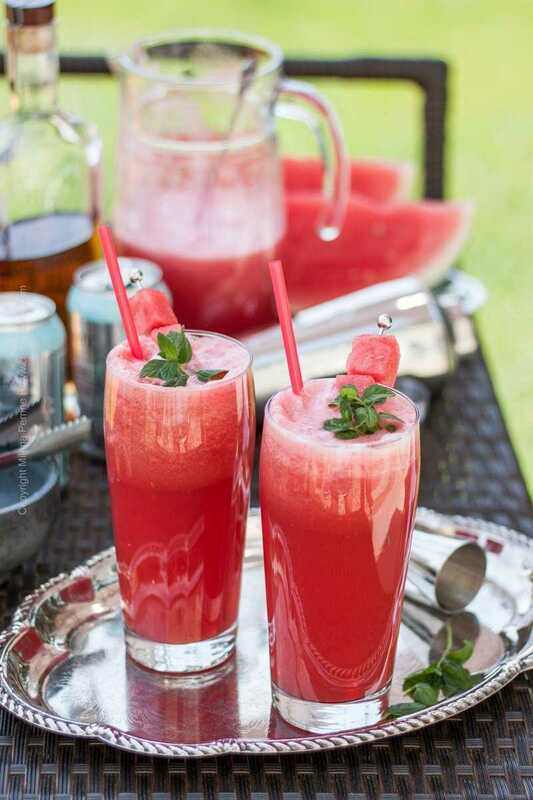 Gently add enough watermelon juice (or slush) into each glass to fill it almost 4/5 of capacity. Shake the bourbon over ice and pour into each glass, dividing equally. 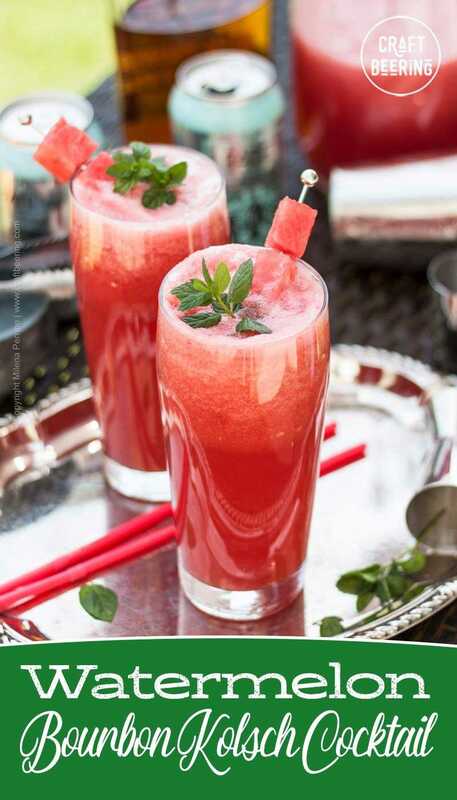 Stir the mixture inside each glass, garnish with fresh mint and small slice of watermelon or a mini watermelon skewer and serve. If you prefer a stronger cocktail feel free to use more bourbon than suggested. So happy it’s watermelon season! And so happy you shared this flavor quencher! You are absolutely right…time to trade up those tired overly sweet daiquiris! Oh la la! This sounds ultra refreshing!! I love watermelon + mint, but haven’t had it with the addition of bourbon. What a perfect summer thirst quencher while having friends over for a bbq! The weather is supposed to be nice this coming weekend so this one will have to happen 🙂 Pinned! I think I’ve told you before that I’m a sucker for a pink drink–and this is no different. It’s HOT here today (no surprise) and this looks like a great way to cool down. Plus, I’ve seen some good looking watermelon at the store lately. . .I might have to pick one up tomorrow!